Lately there's been a wave of magazine and newspaper features discussing the rise of the solid perfume "trend." Of course, solid perfumes have been around since ancient Egypt, and they were revived in the twentieth century through the efforts of Molinard, Estee Lauder, and Avon (to name just a few examples), but it does seem that more and more companies are offering solid fragrances right now. I'll admit that I haven't tried very many solids, other than a cherished Youth Dew "cameo" compact and some wonderful Crazylibellule and the Poppies Crazysticks. I'm generally more of a "spritzer." However, the new perfume palettes from Love, Me Scents caught my eye. They're packaged in sturdy little cardboard "books," similar to the makeup palettes sold by companies like Too Faced and The Balm, and the one called In the Garden has a Klimt-inspired cover design, embossed with gold ink. I can't recall any other company releasing a solid perfume palette, except Sonia Kashuk for Target, and I've never been able to find those in person. 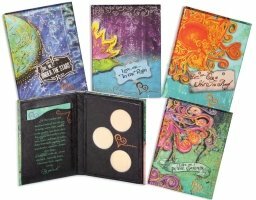 Each Love, Me palette includes three scents, a card with suggestions for layering the fragrances, and some mood-setting text. In The Garden's "story" is a steam-of-consciousness list of childhood memories about playing outside in the summertime, including "ladybugs & polka dots, lemonade, raspberry jam... butterflies in the air..." I was glad to find that In The Garden's trio of fragrances was less little-girlish than the accompanying verbiage. The three scents are named Earth, Whisper, and Sweetness. Earth is the most complex and intriguing one. It's described as "clean, fresh, grass," but its "fresh" green top is mixed into something duskier and more dirt-like, in addition to a peppery white-floral note, so that you really do get the effect of a shady garden with just a stroke of your finger. Whisper, listed as "vanilla, musk, honey, neroli," turns out to be a subdued little cousin to the infamous Thierry Mugler Angel. It definitely has cocoa and patchouli as well as the honeyed musk note, but it's a much more easygoing way to wear the Angel idea. Sweetness is the simplest and lightest of the palette's three components, a bouquet of "honeysuckle, rose, jasmine" with a dominant honeysuckle note and some ylang ylang hovering behind it. I didn't specifically plan this review to run on Mother's Day weekend, but come to think of it, this palette would make a nice little gift for a mother, sister, or female friend who wants to experiment with scent. It would also be appreciated by anyone who wants to keep her fragrance subtle, who travels often, or who just enjoys whimsical packaging. The fragrances are blended into a gentle base of safflower seed oil, beeswax, and shea butter, and their aromas stay close to the wearer's skin. The scents don't last especially long, but they can easily be refreshed, especially if you carry the palette with you — to work, on a vacation, into a real garden, wherever you please. 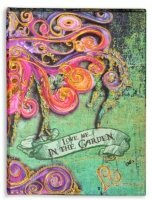 Love, Me...In the Garden solid perfume palette sells for $25 at the Love, Me website. They are pretty! Not sure where they ship… let us know what you find! Does the palette have any type of closure on it, so that you and carry it in a purse without it coming open and getting? One of the advantages of solid perfume is portability. It is usually smaller than a spray bottle, and you don’t worry about it leaking out. I am reminded of the Coty Sweet Earth solid compacts in the 70’s, although those were definitely not sophisticated fragrances. 50Roses, the palette is lightweight, and it feels like it might have a magnet or magnetic strip concealed in the cover. I must have just missed those Coty solids… but they sound wonderful! Jessica, I had one of the Coty Sweet Earth compacts in the late 70’s when I was in 7th or 8th grade, although I don’t remember which one. I think it was one of the florals, though. I carried it in my purse all the time, so I could apply it during the day whenever I wanted. It was in a plastic case with a snap closure, so it stayed clean and didn’t pick up any of the “stuff” that always accumulates in the bottom of a purse. The scents, as I said, were not “sophisticated”. They were quite simple, and in fact would probably be accurately described as soliflores–lilac or honeysuckle or whatever. They were intended to be mixed and matched. You could wear just one or a combination of 2 or all 3 at once. They did tend to be quite sweet, and were no doubt aimed at a youthful customer, and were in fact quite popular with the teenage crowd. They did seem to wear rather close to the skin, so you never got gagged by someone who had put on too much. They were more for the enjoyment of the wearer, which, after all, is why I wear perfume–for my own pleasure. I don’t know if you are familiar with the Vermont Country Store, but they have a recreated version of the Sweet Earth compacts. I just checked, and they only have two choices available, so I do not know if they are temporarily out of stock or if they are discontinuing this item. Their price is $25 for a compact with three coordinating scents. I have not tried any of these reissued versions, so I cannot give an appraisal of them. 50, I love the Vermont Country Store! I’ll have to check the site. Thanks! What a pretty palette and a nice gift idea – especially for someone who is starting to love fragrances. Very cute, and probably more purse friendly than a glass bottle. I’m not a huge fan of solid perfume myself, because of the applying-problem. But CrazylibelluleAtP-sticks are great fun! Jorid, I think it *would* be a nice gift for someone who wants to play with fragrance a bit! Most anyone who was around in the seventies will remember Coty’s Sweet Earth palettes of solid perfumes: there were collections of three or four single-note (or single-idea) scents to be worn singly or mixed and matched–a couple of collections of flowers, one of woods, and one of grasses, I think. L’Artisan Parfumeur once did a palette, but it wasn’t exactly solid perfumes–it was compressed powders. If memory serves, the palette was a wooden box like an artist’s watercolour box containing discs of perfume notes, six in all, each a different (very pale, almost pigmentless) colour, with six long, slender colour-coded brushes, so you could mix and match the scents and literally paint a scented composition onto your skin. This would have been probably twenty years ago, and I’m sure it’s long-discontinued: I can’t even find a reference to it on the Interwebs. But I saw it in person (at Holt Renfrew in Toronto), so I know it existed. Interesting history, Pyramus, though the concept of the L’AP isn’t personally appealing to me (and perhaps wasn’t to many others, either, since it’s no longer around). Darn, those Coty Sweet Earth solid scents must have been fun. Were they meant to be carried in the pockets of jeans, etc.? Very 70s, sort of wholesome! And I don’t even remember that L’Artisan set. Alas. All the girls in the seventies–I had three sisters–had big ol’ shoulder purses, often of patchwork leather, which invariably contained a large-toothed comb (for those big feathered Farrah Fawcett hairdos) or an afro pick, a large-size Bonne Bell Lipsmacker or roll-on Kissing Potion gloss, and some sort of fragrance–either the Coty Sweet earth compact or a wee bottle of Love’s Baby Soft. Oh, those were simpler times. Ah yes, I carried a Kissing Potion or an Avon lip balm at all times! and my friends all owned Love’s Baby Soft in the early 80s. LOL, pyramus! Exactly correct, right down to the patchwork purse. Simpler times, indeed. I pretty much used to eat the Kissing Potion. I remember in 6th grade my friends and I would put it on every chance we got, and then lick it off, reapply, lick it off, reapply… Mine was bubblegum flavor, which may explain my total lack of interest in anything bubblegum now. Oh, and I totally remember the Coty solids. I have some of those, but I can’t for the life of me remember what scents they were. These are cute! I’m always tempted by solids – love the concept, but almost never actually buy or wear them. Haunani, Solids do have such potential for cute packaging. I wonder whether there are collectors who concentrate on solid perfumes, old and new. I was around in the 70’s and that’s when I first encountered the Coty Sweet Earth solids. I loved them (I had grasses, flowers, and woods – pyramus, you’re quite correct !) and carried them with me at school every day. Now I like the Pacifica solids and especially the swivel-up packaging of the Crazy Ls. These look interesting – and pretty! Another Coty fan! I wonder whether the Love, Me people were aware of those and owned any, back in the 1970s. And yes, the Crazylibellules are so much fun to use. I agree that the solids are convenient to carry. They certainly weight less than carry a full bottle in your purse. Still not a fan though. Although I don’t want sillage that knocks over my friends and coworkers the solids wear so close to the skin that I can’t smell anything. I do like the Pacific solids for layering purposes but they’re too wimpy on their own. Thanna, solids *are* especially useful for offices and other close, not-well-ventilated quarters! These do look like they make cute gifts, though my favorite solid for gifting are Pacifica. The one solid I own is CdG Rhubarb and I just don’t use it much because solids don’t agree with me (I like to apply around the neck and they’re too waxy/oily feeling on my skin). I find I get a much better scent experience from a scented lotion or cream. I’m curious about Molinard concretas — have been lemming Nirmala — but they’re fairly expensive (though I just checked eb*y and there are a few there at around $30). Joe, I saw a vintage poster for some early Molinard “concretas”… 1920s, I believe. They were fabulous! Check out eBay for some examples and information about them. I just want the poster! Uh, let’s try that again. Jessica, thanks for this review and a new topic – solids. I’m curious about whether your Youth Dew solid is current or vintage. I’ve seen a lot of cute solid compacts on ebay, but I tend to assume that the solids would be more likely to “turn” than alcohol based perfume, etc. Have you or anyone else here had experience with the vintage solids? Nozkoz, My Youth Dew compact is a holiday edition from three or four years ago, with a “cameo” lid. It’s strongly scented for a solid, and very true to the liquid fragrance. I don’t own any vintage EL compacts, but I wish I did! How interesting! Fragrance is really an ancient art form, isn’t it. I always love solids. Since I travel, they’re functional. And, they’re usually small, so you can have more, right? The Pacifica solids are my favorites, but I enjoy a few of LUSH’s solids, and Fragonard. Love the uniqueness of these, but I agree that the packaging is less convenient than a tiny pot for carrying around in a pocket or purse. Wish I could have grown up in the 70s and tried those Coty solids! Instead I had to be a teenager during the late 90s so everyone was drenched in Victoria’s Secret Lovespell and B&BW Raspberry sugary sweetness. I own Potion from Lush! I’m a sucker for anything carnation, of course. I’ve tested a few Pacifica lotions during my Sephora visits, but never the solids. Oh, THE DOLL HEADS! Those are more than adorable. I know someone who succumbed to the cuteness and bought the set… cough *robin* cough.